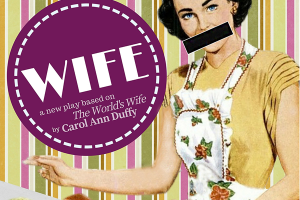 Wife is a 70 minute unyielding one woman show, which explores the predetermined figure of what a wife is supposed to be and celebrates the women who hold the knowledge to overcome it. In this performance Ella Duffy combines fable and fact to make a bold statement of wives transcending the ages. Thematically charged, Wife evaluates love, loss and violence. Wrapped up in the construct of modern society, stereotypes seem a thing of the past, but still enforced and often disregarded they still remain an oppressive force. However, Wife is not a show exploring the derogatory, instead it reveals the wives that transcend the knowledge and thought of what it means to be present. It makes the statement that they have always been there, watching, supporting and sometimes festering. Behind every great man; Mrs Icarus, Queen Herod, Eleanor Roosevelt, Mrs Quasimod, are the wives of history, art and legend. Formed around the poems from The World’s Wife by Poet Laureate Carol Ann Duffy, Wife connects female experience throughout time, mythology and the world. Playing at The Corpus Playroom, Wife, an amalgamation of poetry, verbatim and monologue, is a personal and universal exploration of how women have been masked by their men. Perfectly placed in The Corpus Playroom, this show feels Edinburgh ready. Simply constructed with its touches of Brechtian techniques, this show has a playful energy which is unpredictable. Consisting of a couple of saucepans, two chairs and a washing line, the only thing not stereotypically placed is the flip-chart paper, which connects the journey of the show. An exciting turn of the paper and we move on, into the world of the next wife. From husband puppetry to absent chair duets, this performance grasps its moments paying homage to the stories it tells. Never tiring from the multitude of characters and dynamic performances, Wife feels so much than a one woman show. Moving, passionate and versatile Wife is an exploration, a journey that you cannot resist being taken on. The performed poetry engages and delights, reminding you of Carol Ann Duffy’s pure perfection. As the daughter of Carol, Ella presents a formidable connection to the language which is enlightening. Never faltering from the beauty of the language but never stuck on the rhyme, Ella remains engaging throughout. Within the performance a trust is created and this is a credit to the creative decisions Ella and director Robbie Taylor Hunt have made.